Here's solution to fix problem caused by iPhone 6/6 Plus 1GB RAM. The fact that iPhone 6/6 Plus only have 1GB RAM disappoints fans even though it is highly expected that iPhone 6/6 Plus can feature 2GB RAM like Android smartphones. So far, results of benchmark tests and reviews on the two Apple latest devices indicate that 1GB RAM is enough to handle all tasks well since iOS 8 is much more efficient at multitasking. However, disadvantages of 1GB RAM will be revealed alongside with upgrade of operate system leading to more tasks and processes. 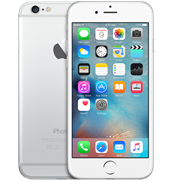 This article will introduce how to fix iPhone 6/6 Plus 1GB RAM problems. 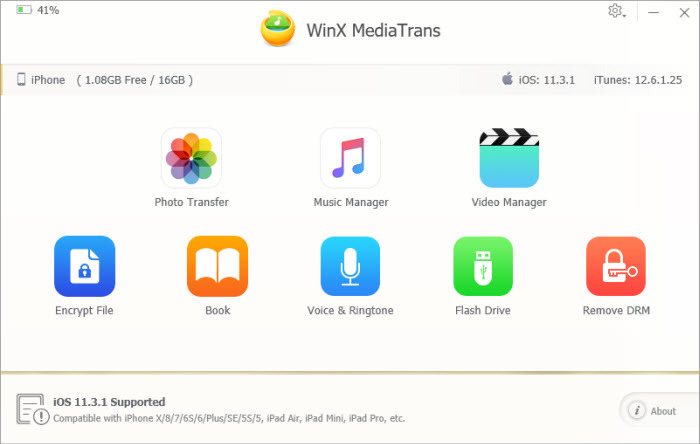 WinX MediaTrans is usable to fast transfer photos, videos and songs from iPhone 6 to computer before you delete those space-occupied media files to free up RAM making iOS run on 1GB iPhone smoothly without interruptions. RAM (Random Access Memory) can be taken as a container to store data of running apps temporarily, which can influence speed to handle processes on phones. In consideration of power saving and optimized iOS 8, it seems that 1GM RAM is quite suitable for iPhone 6/6 Plus. However, no one can ensure that 1GB RAM is completely enough when more demands on multitasking are required and operation system is continuously upgraded. If so, some problems may appear. For example, online HD movies may not be played very smoothly when you are downloading games/videos/apps. What's worse is that your phone possibly crashes for too much apps running at the same time. Anyway, it is impossible to upgrade iPhone 6/6 Plus 1GB RAM. Therefore, what you can do to fix iPhone 6/6 Plus 1GB RAM problem is to free up RAM. How to Free Up iPhone 6/6 Plus 1GB RAM? It is suggested to delete apps which are not frequently used for releasing more storage and clearing unnecessary data info stored in RAM. Go to Settings - General - Usage. Tap apps which you no longer need. Hit Delete App button and confirm to delete by hitting "Delete App". There are many easy-to-use apps developed for managing RAM, such as Free RAM, MemoryInfo and so on. Open App Store and search for those apps. Purchase and install them on your iPhone. Then, follow the guide to clear RAM. Certainly, if you want to use unauthorized free apps to free up iPhone 6/6 Plus 1GB RAM, you need to jailbreak iPhone 6/6 Plus at first. HD videos, feature-length movies, full episodes of TV shows, high quality music/photos will take up tons of storage. Sometimes, they may influence other process running speed, for example, long time to access website. In that case, you are suggested to backup precious media files to computer and then remove them from your iPhone 6. WinX MediaTrans has a powerful ability to fast transfer photos, videos and music from iPhone to computer within a few clicks. Apart from transfer all files at one, users are allowed to sync one or certain items. With this best iPhone file transfer software, users are free to delete videos and songs from iPhone 6/Plus which has copied to computer. With more free storage, tasks can be well handled in spite of iPhone 6/6 Plus 1GB RAM. 1. Download and Install WinX MediaTrans on your computer. Launch it after it is successfully installed. Plug in your iPhone 6 to computer via USB cable. Tap "Trust" on iPhone screen if a message pops up asking if trusting this computer. 2. Later, the main inferface with five modules is shown. Hit Photo Transfer, Music Manager or Video to access pages where all media files are listed. Then, hit Export button to send pics, videos, songs to computer. 3. After all selected files are transfered, delete original file on iPhone 6/Plus. Also, you can Delete videos and songs via WinX MediaTrans and then Sync to remove copied files from iPhone. Indeed, we cannot ignore problems caused by iPhone 6/6 Plus 1GB RAM, for example lack of smoothness to play HD movies/videos or phone crash during operating multitasking. The above three methods for freeing up RAM is pretty helpful when it is unable to improve hardware to fix iPhone 6/6 Plus 1GB RAM problems. • Convert and compress 8K/4K/1080P HD videos to supported formats by iPhone SE/6s (Plus)/6 (Plus) etc. while keeping a high level of quality for making any video play on Apple iPhone without trouble. • Built in 370+ video/audio codecs, 410+ device profiles, it is available to convert online/local videos to MP4, AVI, WMV, MOV, FLV, 3GP, iPad, Android, Windows devices, PS3/4, Xbox and more popular formats/gadgets at No.1 fast speed.